This special edition, in a fine and robust, classic style case, is offered with unique product features. The set includes an exclusively designed pop screen. Its characteristic design is a reminiscence of the sixties, the early years of the U 87. The entire set shows the stylish combination of polished nickel parts with the traditional Neumann matte nickel look. Microphone, elastic suspension and pop screen are instantly recognizable. The set contains a dust cover embroidered with the anniversary logo, and a pair of white gloves for handling this valuable equipment. A signed and framed certificate of authenticity with individual serial number completes each original set. The U 87 is equipped with a large dual-diaphragm capsule with three directional patterns: omnidirectional, cardioid and figure-8. These are selectable with a switch below the headgrille. A 10 dB attenuation switch is located on the rear. It enables the microphone to handle sound pressure levels up to 127 dB without distortion. Furthermore, the low frequency response can be reduced to compensate for proximity effect. 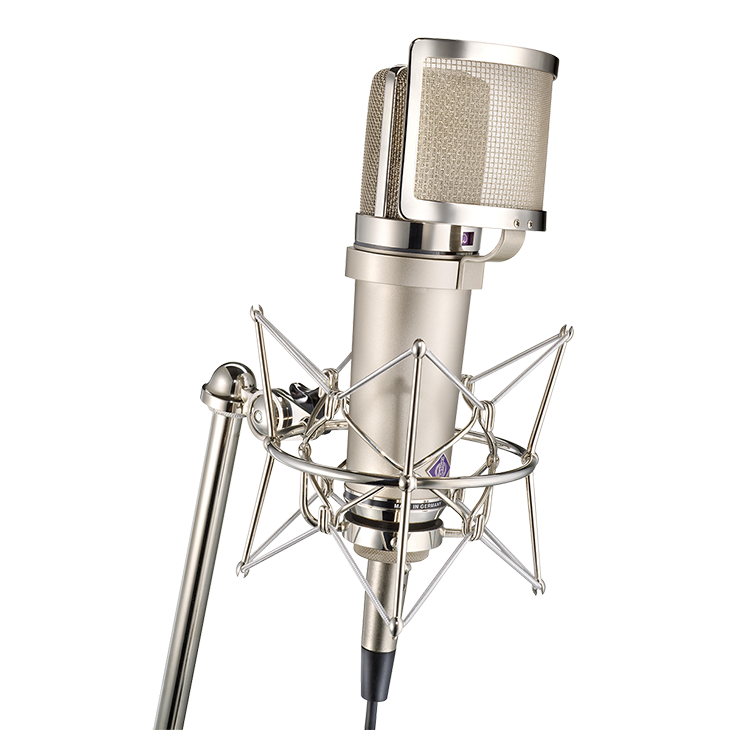 The U 87 Ai condenser microphone is a large diaphragm microphone with three polar patterns and a unique frequency and transient response characteristic. Users recognize the microphone immediately by its distinctive design. It is a good choice for most general purpose applications in studios, for broadcasting, film and television. The U 87 Ai is used as a main microphone for orchestra recordings, as a spot mic for single instruments, and extensively as a vocal microphone for all types of music and speech. The U 87 Ai is addressed from the front, marked with the Neumann logo. The frequency response of the cardioid and figure-8 directional characteristics are very flat for frontal sound incidence, even in the upper frequency range. The microphone can be used very close to a sound source without the sound becoming unnaturally harsh. By means of a high-pass filter interferences through subsonic and low frequencies are reduced remarkably. The dual-diaphragm capsule is elastically mounted and protected by a large headgrille. A switch below the headgrille selects the three directional patterns: omnidirectional, cardioid and figure-8. A window above this switch shows the symbol of the selected characteristic. The letter A in the name indicates a more recent generation, as compared to the U 87 i microphones that were built from 1967 to 1986. Modifications apply to the electronic components of the microphone only; the capsule remained unchanged. The present-day circuitry increases the operational headroom of the U 87 Ai by supplying the bias voltages for the capsule through a reduced resistance. The result is a higher sensitivity of 10 dB for identical sound pressure levels, and an improved S/N ratio of 3 dB. A switch located at the rear attenuates the sensitivity by 10 dB. When this switch is activated, the microphone accepts sound pressure levels up to 127 dB (equivalent to a sound pressure of 45 Pa) without distortion. An additional switch at the rear allows to change the microphone's cutoff frequency. This reduces low frequency interference directly at the input of the microphone amplifier. This setting also compensates for the unavoidable bass boost that occurs with all pressure gradient transducers when they are used at close distance (proximity effect). The cardioid characteristic maintains a smooth frequency response at a distance of 30 to 40 cm, the figure-8 characteristic even at a distance of 15 to 20 cm. "The bottom line is that the TLM 103 is a phenomenal microphone. Five stars go to Neumann on this one... it's a keeper!"